Rihanna has joined forces with MAC to launch her own makeup line, RiRi [Hearts] MAC, with the first release--a red lipstick called RiRi Woo. Rihanna will release her own MAC collection. The "Stay" singer who recently unveiled her first fashion line for British high street chain River Island has teamed up with the luxury cosmetics brand to release four collections over the course of the year under the name RiRi [Hearts] MAC. "I've been using MAC on tour for such a long time it was a natural fit for me. I have always loved makeup, and I always said that if I do it, I want to do it with a credible brand." Rihanna's first release with MAC will be a new spin on the company's Ruby Woo red lipstick—a favourite of the 25-year-old singer's—which will be titled RiRi Woo. The lipstick's release will coincide with the singer's Diamonds World Tour concerts on May 4 and 5 in New York City, with a pop-up stall celebrating the launch at her concert in Brooklyn's Barclays Center. 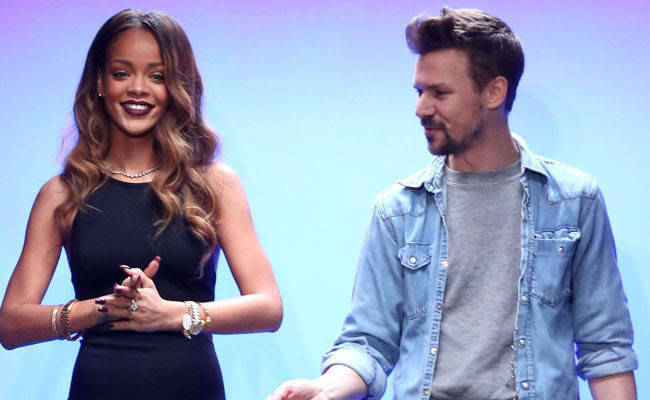 John Demsey of MAC's parent company Estee Lauder insisted Rihanna will be a "long-term" collaborator with the brand. "This was not a front. This is a true, organic collaboration based on mutual admiration and respect. These four collections are like four tracks on a Rihanna compilation," he says. He added: "Each one has its own vibe, look, special makeup packaging and flavor. This is really the convergence of pop culture, fast fashion, and iconic style and makeup." Following the release of RiRi Woo, a second collection will go on sale in the summer, followed by a fall collection and a fourth collection to tie in with the Christmas season.